The Craft Connection Brewery Tour experience will visit 3-4 breweries in 3-4 hours. Public tours are every Friday night, Saturday afternoon, and Saturday evening. Tour options are 3-hour, 3 brewery tour ($50/person), 3.5-hour, 3 brewery tour ($55/person), and 4-hour, 4 brewery tour ($60/person). Transportation, tours, and tastings are included in the price – you won’t go thirsty! #HOPON Anytime requests are private tours where 10 or more guests can arrange a tour with ben@craftconnectiontours.com. You can select the breweries, pickup and drop off location (near downtown), and the timeframe of the tour. These tours are available any time during the week or weekend! You will drink several 6-8 oz. samples at each brewery tour stop of what’s fresh, trendy, or recommended by the brewer. This is included in the price of admission (beer me!). You spend roughly 30-40 minutes at each brewery enjoying tours and tastings hosted by your tour guide. In order to get the most out of the tour, we are on a regimented schedule. Your wonderful tour guide will help keep you on task. Your cooperation with the tour schedule will allow you to enjoy all breweries. Eat a good, hearty meal before your tour! 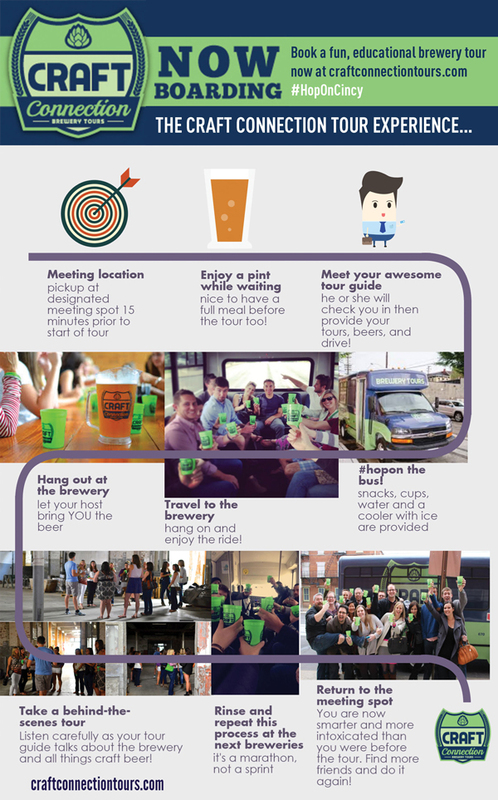 The driver is your tour guide, host, and fun-loving, craft beer enthusiast! Treat this person as your “BFF” as he or she will safely transport you to each brewery, provide interesting nuggets of beer knowledge, and fill in the awkward moments with corny jokes. While yoga is not their forte, flexibility is their strength. And, yes, the driver does accept tips – how thoughtful of you to ask. Save a cow, tip your driver! Step into our bus devoted to all things craft beer. Water, snacks, and souvenir tasting cups will be provided on the bus. The bus is equipped with a cooler to store growlers (if you so-choose) purchased at breweries. We encourage socially responsible drinking – drink local and don’t be annoying. Age Policy: Persons must be at least 21 years of age to reserve and participate on the Craft Connection tour – no exceptions. Valid ID must be shown to driver prior to departure. Minimum Passenger Count: Tours have a minimum of 6 passengers. You do not have to bring the tour 6 people, it just needs a total of 6 to run. If the passengers count is not met, Craft Connection will call/email you within 24 hours of your scheduled tour to make arrangements to move your reservation to another date or discuss alternative options. Cancellation Policy: Cancellation occurring prior to 72 hours will be eligible for a refund of tour fare minus card processing fees. Cancellation occurring within 72 hours of tour will not receive refund of tour. Craft Connection reserves the right to cancel tours due to unsafe weather or unfavorable roadways. Consideration for such circumstances is determined by the host/driver. At time of tour cancellation due to said circumstances, all available efforts will be taken to notify the scheduled customers. Refund Policy: Refunds are granted only for cancellations occurring prior to 72 hours of scheduled tour, and if tour is cancelled by Craft Connection. Tours may be cancelled at the discretion of Craft Connection due to harsh or severe weather resulting in unfavorable and unsafe road conditions. Note: Passengers that appear to be intoxicated at beginning of tour, at the discretion of the tour host/driver, will not be allowed on the tour and no refund will be applied. The Craft Connection Brewery Tour experience will visit 4 breweries in 4 hours. Tours are Friday 7-11pm and Saturday 12-4pm & 5-9pm. Pickup and drop off will be at HalfCut in OTR. You will drink a few 6-8 oz. samples at each brewery tour stop. This is included in the price of admission (beer me!) which is $55. The duration of the tour will be four hours, minus Thursday tours which are three hours. This includes driving to each brewery, bathroom breaks, tours and beer tastings. Restrooms are available at all brewery locations. So many breweries in so little time, you might be saying! We fit a lot of beer into a small amount of time. In order to get the most out of the tour, we are on a regimented schedule. Your wonderful tour guide will help keep you on task. Your cooperation with the tour schedule will allow you to enjoy all breweries. After the tour, feel free to continue your evening at Half Cut or enjoy OTR’s selection of excellent restaurants. The tour guide will answer any and all questions you have about Cincinnati beer and local activities/events. At the risk of sounding like your mother (who is welcome to book a ticket btw), we highly recommend eating prior to coming on the tour. These beers are heavier and higher in alcohol content than the average beer consumer is accustomed to. As some beers might drink like a meal, you will actually need a real one. “Howdy folks” is how you’ll be greeted by our fun-loving, craft beer enthusiast, driver/host. Treat this person as your “BFF” as he will safely transport you to each brewery, provide interesting nuggets of beer knowledge, and fill in the awkward moments with corny jokes. While yoga is not his forte, flexibility is his strength. And, yes the driver does accept tips – how thoughtful of you to ask. Save a cow, tip your driver. Step into our bus devoted to all things Cincinnati craft beer. The bus is a lean, mean shuttle machine that comfortably fits 14 passengers. Water, snacks and cups will be provided on the bus. The bus is equipped with a cooler to store growlers (if you so-choose) purchased at breweries. All beer on the bus must be purchased either at HalfCut or the breweries. We encourage socially responsible drinking – drink local and don’t be annoying. READY TO GO? BOOK A TOUR TODAY!